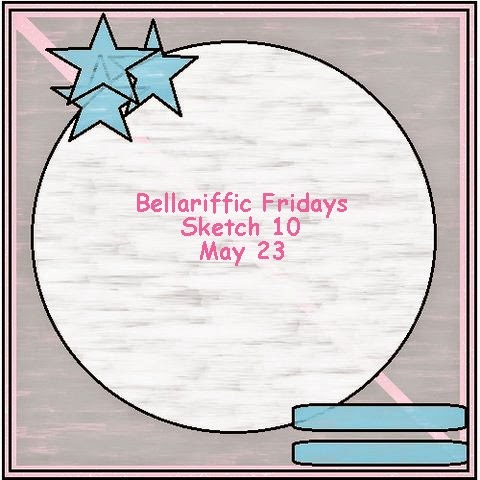 This week's Bellarific Friday challenge is all about using stitching on your card. I have to be honest.... I can't sew for my life!!! I don't like the look of faux stitchiing so I decided to use some burlap trim that has stitching on it... Score!!! Pretty smart eh?? For my card, I decided to use the sentiment from the set called "Closeup Big Rock". I stamped it onto some Crate Paper DP in black ink and then sponged the edges of all of the DP's with Chocolate Chip ink. This week's challenge is a sketch. Check it out. You have until Thursday night to get your card in to Emily.